Both songs on my 45 are about one of the most famous and controversial governors in the history of the US, George Corley Wallace Jr., specifically his 1968 presidential campaign. Now, maybe all politicians are a little Faustian, but Wallace gave the devil a run for his money. He began his political career as a moderate backed by the NAACP. But after being defeated in a primary election for governor by a foul-mouthed white supremacist he decided to change his politics and hire a speech writer from the KKK. He won the governorship by a landslide in 1962. 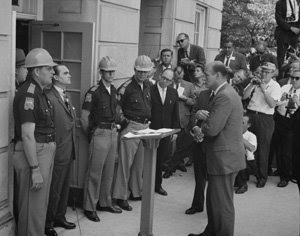 His "Stand in the Schoolhouse Door" in 1963, which intended to prevent black students from registering for courses at the University of Alabama, prompted President John F. Kennedy to order federal intervention. The resulting national attention made Wallace a hero to segregationists and running as an independent in the presidential election of 1968, he won nearly 10 million votes. He also branded Alabama with the national image of a backwater filled with vicious crackers who would keep the black population down by any means necessary. Alabamians who didn't support Wallace where not happy about any of this. 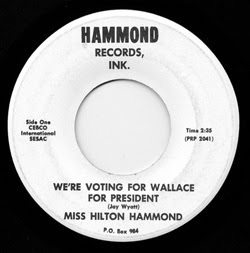 When Miss Hilton Hammond presented two songs critical of George Wallace to K-Ark records where she was under contract, they told her there was no way they would release them. So she recorded them in Birmingham and released them herself on Hammond Records, Ink. Side two is "Won't You Come Home George Wallace" and simply argues that Wallace should stay at home and off the presidential campaign trail. It's sung to "Bill Bailey" played on the piano. Side one can heard here.